An automated external defibrillator (AED), is a small electronic device that can be used by almost anyone to automatically diagnose and treat heart arrythmias. The devices have become much more common in public places, particularly at event centers and sports arenas. Persons who experience full cardiac arrest are dead. Only through the quick application of rescue cardio-pulminary resusitation (CPR) and external defibrillation can a person be brought back to life. 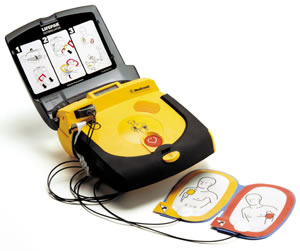 Ideally a lay person (rescuer) should be trained in CPR to successfully use an AED. However, newer model AED's talk a lay person through CPR and sets a beat for the rescuer to follow while applying chest compressions at a rate of 100/minute (or 30 compressions to 2 breaths). A barrier, either a face mask or face shield should be used by a rescuer to prevent the spread of disease and avoid getting vomit into the rescuer's mouth when the patient regurgitates. Upon determining a person is not breathing a rescuer should lay the patient down on his or her back and open the airway. Advanced Life Support (ALS) assistance should be summoned via the Emergency Medical System (EMS) if possible before starting CPR or applying an AED. Begin CPR to raise the patient's blood pressure while preparing the AED. Open the AED and turn it on. Remove all clothing (including bras) from the chest so the adhesive pads can be applied to the patient. If the patient has a lot of chest hair shave it off where the pads go or they may not adhere properly. Apply the pads as shown on diagrams, for adults and children over 8 years old one pad goes diagonally across the upper right chest near the collar bone, the second pad goes on the side of the chest just below the left breast. For infants and young children a pad goes on the center of the back and the other goes on the center of the chest. The AED will give instructions not to touch the patient as it scans for electrical activity. Touching the patient may cause movement and disrupt the scan. If the patient has sufficient blood pressure and is not in arrythmia it will tell the rescuer that no further CPR is needed and no shock is advised. If the patient is in arrythmia the AED will advise to apply a shock and the button to administer the shock will light up. If the patient lacks sufficient heart activity then the AED will state that no shock is advised and to administer CPR. After a few minutes the AED will again instruct the rescuer to stop and it will reassess the patient's condition. Anyone who has been brought back to life with an AED and/or CPR should be evaluated and treated by a doctor to prevent further heart attacks. This page was last modified on 23 December 2013, at 16:46.